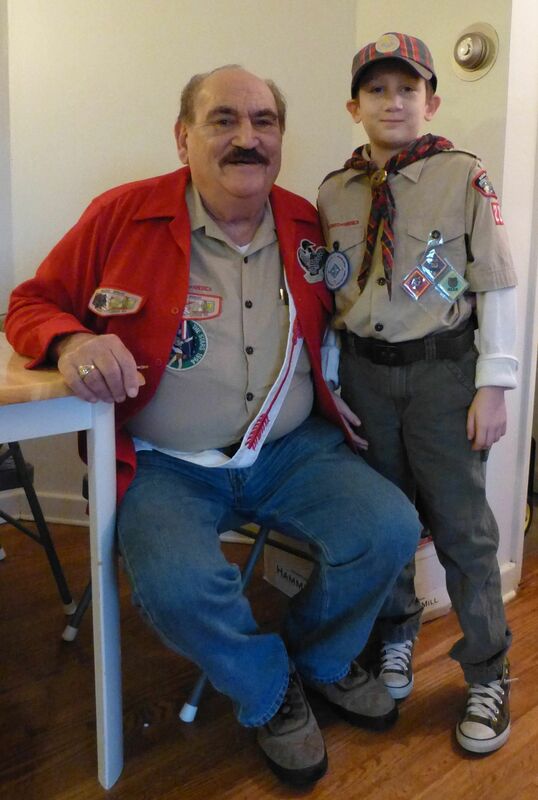 This past weekend was my son’s final Pinewood Derby before crossing over to Boy Scouts. For his final car, he wanted something spectacular. He had me make him “stickers” at work to go on his car to make it look professional. When I say “stickers”, I mean pieces of plastic with 3M backing engraved into the design pieces he wanted. Revell makes official BSA wheels in more than just black that comes with the kit you receive from the Cub Scout. He opted for the Blue but you could also buy red and yellow. Seeing how his mom can craft but not really whittle wood, we also bought the Funny Car body. The paints were on sale for 88¢ at A.C. Moore. We used Folk Art Metallic Blue Sapphire and Folk Art Metallic Silver Anniversary. He won a medal from Most Futuristic Car and earned the 3rd place trophy for his Den. Of course, his sister made her own car as well because she felt it wasn’t fair that the Girl Scouts didn’t have a derby too. She layered her paints. the bottom 2 coats were Folk Art Pearl Aqua Moire and then it was topped with Folk Art Extreme Glitter Aqua. She glued seed beads that we had to make snowflakes. The window was done using her brother’s paint. My son is now a Webelo 2 Cub Scout. Over the past year, to make understanding and organizing all the achievements, belt loops, and pins easier for a disorganized child with ADHD to keep track of his progress, I made worksheets to go with many of the requirements. Here are the forms I have made. I will continue to add more as I make them or find where I saved them.